Provincial styled retreat with spectucular ocean views. Cheri on Sea is our French styled boutique ocean viewed retreat. MAGNIFIQUE!! 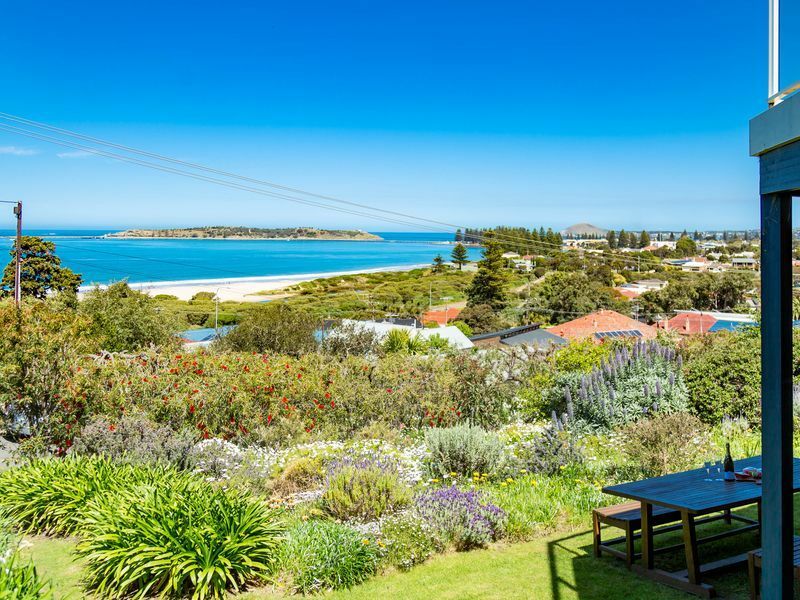 Spectacular Vista, the best views in Victor Harbor!! Seaviews, castles, bluff, estuary.....Why go to Europe?? It offers 2 very spacious bedrooms with a luxurious king bed in the master bedroom, and a romantic four poster canopied queen in the second equally large bedroom, both with full wardrobes. The bedrooms lead into the brand new contemporary kitchen, and dining area with large teak dining table seating 8 and open gas log fire. All designed in French provincial décor. The bathroom has also been recently upgraded with rain shower and marble style tiles. There is a separate lounge room, with 3 over sized suede lounge suite, with a 42 inch LCD with DVD, CD Player with a collection of DVDs and CDs . Both the dining room and lounge have French doors that lead out to the alfresco dining area in the beautiful garden with webber bbq. There is large out door dining setting or you can choose to relax and take in the view in the two designer Hampton chairs. Cheri on sea has spectacular ocean views and is perfect for a romantic getaway, a couples getaway, girls weekend, Golfing trips, stop over to Kangaroo Island or just to relax and unwind. Close to McCracken Golf course and country club. 20 minute walk to the town center or a 2 minute drive. Enjoy clean air, clean beaches, clean living !!!!!! Enjoy.... the fresh produce of the sea adjacent to the coast. The wines of the surrounding wineries and produce from the weekend farmers market. PREMIUM Linen and towels included. Also toiletries to get you started. I am a property manager and hotelier and manage several boutique properties in the Fleurieu Peninsular. I have a very high standard when chosing properties to manage and all must have ocean views. I have studied Visual Arts and still continue my Art career, mainly as a hobby as I have two young kids under 5. I love to travel, cook, and spend time with my family. Not only has this property have one of the best views in Victor Harbor, it can have these viewed from inside or in the beautiful landscaped garden. It has been professionally decorated with a french style with original Art , antiques and collectables. It is exceptionally spacious with huge bedrooms and the king room you have a view of the ocean from. Short walk to the beach, private garden, gas log fire, king bed. Professionally laundered linen, and towels , lovely toiletries to get you started, and tea and coffee provided. Four poster queen room with dressing table and full wardrobe in a spacious bedroom. With two sets of doors for privacy from other bedroom . The Southern Right Whale have their babies between the months of May - Oct and can be seen from this property if they are out. Pristine sand, and quiet beach. Great for all ages. Panoramic views of the Southern Ocean whilst sitting inside with the floor to ceiling windows, or relax in the outdoor setting with the landcaped garden. three oversized couches with tv dvd mounted on the wall and french glass doors to open to the garden and view. nescafe coffe machine with pods. Bespoke, 10 seaker teak dining table with french doors that open to the garden with ocean views. Landscaped garden with hydrangeas,, roses and lavendars. Table and chairs in the outdoor setting, and hampton chairs on the, lawn area that looks over the ocean views. We had a beautiful 2 days away for our anniversary, Thankyou. Very cute apartment, views were stunning, close walk to the beach and into victor harbor. Everything you needed was provided, including books, magazines and movies. Shame we did not get around to trying the port and chocolates. Not long enough. Gorgeous property with huge bedrooms, exceptionally comfortable king in the master bedroom that we were able to enjoy the ocean views out the window from. Also views from the dining room were we enjoyed our breakfast hamper from as well as views from the super comfy lounge room. Wonderful place to relax and unwind, enjoy stunning views and beautiful decor. Fabulous !!! Wonderful setup, with a dream bed and wonderful views. The rooms are great, so comfortable, like home, The views are also amazing, and beautiful. The lunge room is very nice. We would have loved to have stayed longer. Just like being in paradise, bring home beautiful memories, thanks.